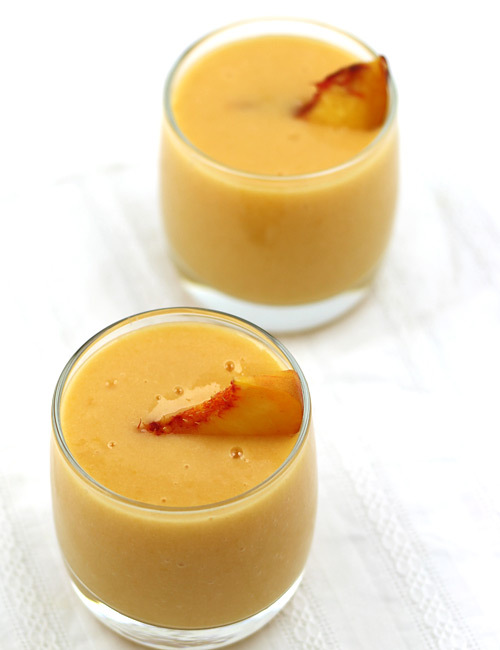 Peaches are highly flavorful fruit that can make some of the best fresh fruit drinks in the world and this simple and easy recipe of peach smoothie with yogurt prepares healthy smoothie by combining just three ingredients; fresh peaches, low fat yogurt and honey. A pinch of ground cinnamon adds a powerful shot of flavor which blends well with juicy peach flavor. 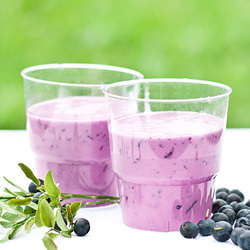 Blend peach, yogurt and honey in a blender until smooth. Add crushed ice and blend on high speed for 30-40 seconds or until slushy. Pour prepared drink into serving glass and sprinkle cinnamon powder over it. Garnish with a sliced peach and serve immediately. If you are making this drink with frozen peaches, add 1/4 cup mango nectar or orange juice to dilute the smoothie.. Taste: Sweet with pure and natural fruit taste. Serving Ideas: Enjoy peach yogurt smoothie at anytime you like it. Its taste and texture makes it an ideal drink for all occasions. So simple, but so yummy. I used frozen peaches and added some green tea to it to dilute it instead of Orange juice and it turned out to be a perfect match. I will make these way more often now. I have made this one just now for my morning snack. I used frozen (thawed) peaches, 2 cups. It is very delicious. Thanks for sharing this recipe.